Capacity: 23Wh. Fits TOSHIBA 10 Thrive, AT100, WT310. Follo 100, AT300/23C, AT105-T108, AT105-. Laptop battery for toshiba. Laptop battery for hp. Laptop battery for dell. Laptop battery for apple. Laptop battery for IBM. Replaces PA3884U-1BRS, PABAS243, PABA243. Compatible Model10" Thrive Tablet. Fits TOSHIBA 10 Thrive, AT100, WT310. Cell: 2Cells. Follo 100, AT300/23C, AT105-T108, AT105-T1032G. Replaces PA3884U-1BRS, PABAS243. Capacity: 23Wh. Follo 100, AT300/23C, AT105-T108, AT105-. Fits TOSHIBA 10 Thrive, AT100, WT310. Cell: 2Cells. Such as battery, ac adapter etc. All item passed FCC / CE / ROHS certificates. Replaces PA3884U-1BRS, PABAS243. Fits TOSHIBA 10 Thrive, AT100, WT310. Follo 100, AT300/23C, AT105-T108, AT105-. Laptop battery for toshiba. Laptop battery for hp. Laptop battery for dell. Laptop battery for apple. Replaces PA3884U-1BRS, PABAS243, PABA243. Fits TOSHIBA 10 Thrive, AT100, WT310. Cell: 2Cells. Such as battery, ac adapter etc. All item passed FCC / CE / ROHS certificates. Currently, our after-sale workmate good at English. (Capacity: 23Wh. Fits TOSHIBA 10 Thrive, AT100, WT310. Follo 100, AT300/23C, AT105-T108, AT105-. Cell: 2Cells. Such as battery, ac adapter etc. All item passed FCC / CE / ROHS certificates. excluded.). PA3884U-1BRR, PA3884U-1BRS, PABAS243. Toshiba AT100 Tablet PC. Toshiba AT100-100 Toshiba AT105 Tablet PC. Toshiba Thrive 7 pad tablet. Toshiba Thrive 10" 10.1"Tablet. Toshiba WT310 Tablet PC. Toshiba AT100-001. PA3884U-1BRR PA3884U-1BRS PA3966U-1EAD PABAS243. Thrive AT105. Thrive 7 pad tablet. Thrive 10" 10.1"Tablet. For Toshiba. for Toshiba. Battery Type:Li-ion. Battery Volt:10.8v. We try our best to do best service. We will make a satisfied response to you as soon as we can. If possible then try to use energy-saving settings on your electronics. PA3884U-1BRR PA3884U-1BRS PA3966U-1EAD PABAS243. Capacity: 23Wh. Toshiba Thrive AT105. Toshiba Thrive 7 pad tablet. Toshiba Thrive 10" 10.1"Tablet. Battery Type: Li-ion. Capacity: 23WH. Type: Battery. Condition: NEW. PA3884U-1BRR, PA3884U-1BRS, PA3966U-1EAD , PABAS243. For Toshiba Thrive AT105. For Toshiba Thrive 7 pad tablet. For Toshiba Thrive 10" 10.1"Tablet. Warranty: one year. • Capacity: 23Wh. for Toshiba Thrive 7 Pad 10" 10.1" AT105. 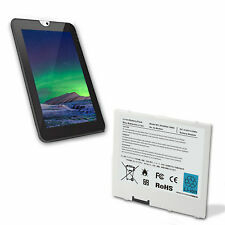 • Compatible for: Toshiba Thrive 7 Pad 10" 10.1" AT105. 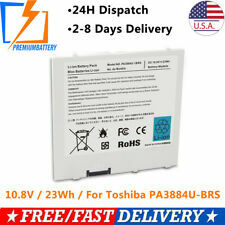 PA3884U-1BRR - Genuine 28Wh Battery. • Battery Model Number: PA3884U-1BRR. 1 x Battery. Condition: Fully Tested. This Unit was pulled from a working toshiba. Important Information. Ending Soon. Also, we do not have a price matching policy. We will not price match to a lower price. Capacity: 23Wh 2030mAh. Toshiba Thrive 7 pad tablet. Toshiba Thrive 10" 10.1"Tablet. Toshiba Thrive AT105. A nice backup to your tablet. Original Battery. Quality Lithium battery with longer service life. Toshiba Thrive Tablet AT105/32GB with USB Cradle, protective case, main battery strong, spare battery very weak. Condition is Used. Shipped with USPS Priority Mail. PA3978U-1BRS H000035460 PABAS255. Toshiba Part Number: H000035460. Compatible Models: Toshiba Thrive AT1S5-SP0101L Thrive AT1S5-SP0101M Thrive AT1S5-T32 Series. We reserve the right to accept or decline your order. PA3884U-1BRR, PA3884U-1BRS, PA3966U-1EAD , PABAS243. Toshiba Thrive AT105. 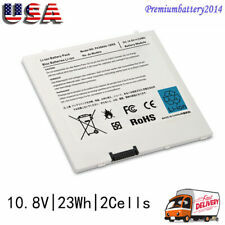 New 23wh/6Cells Genuine Original Battery For Toshiba Thrive 10” Tablet. Toshiba Thrive 7 pad tablet. Toshiba Thrive 10" 10.1"Tablet. New 23wh/6Cells Genuine Original Battery For Toshiba Thrive 10” Tablet. Toshiba Thrive 7 pad tablet. Toshiba Thrive 10" 10.1"Tablet. Toshiba Thrive AT105. Battery type :Li-ion. Rules & Policies. Color :White.